Eagle-eyed gamers may have spotted the occasional copy of C3 Racing: Car Constructors Championship (did they really need both ‘car’ and ‘constructor’ in there?) doing the rounds, a rather bloated moniker seemingly retained for its release on the continent. 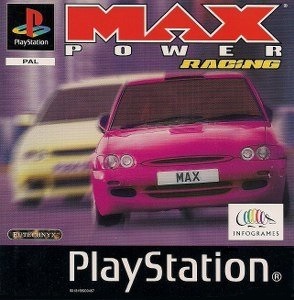 In the UK at least, it was rescued from a lifetime populating lists of the crummiest-named games, when a tie-in with Max Power magazine resulted in a slick, eye-catching new identity, with an additional, violent-pink prototype vehicle thrown in for good measure. Marginal gains you would think, but it many respects, they proved the making of this energetic racer. 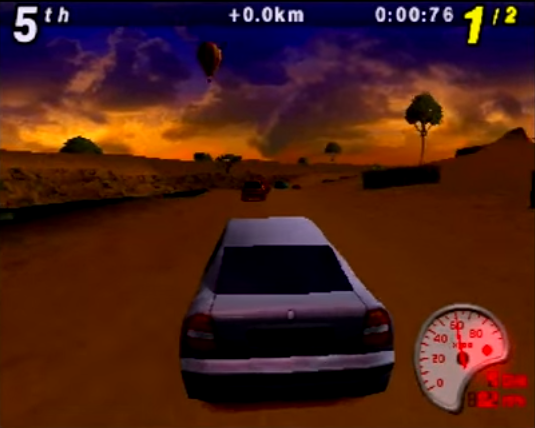 Max Power Racing effortlessly blurred the lines between arcade, sim and rally racer. Indeed, it juggles the three far more effectively than it was perhaps given credit for on release. 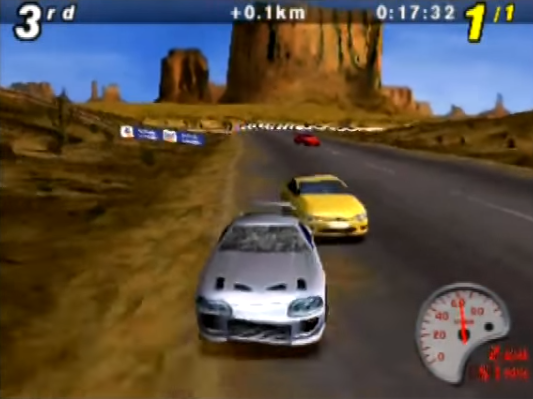 Whilst it retains Total Drivin’s pure, racing-first focus, Eutechnyx correctly identified that the want for realism in racers had been accelerated by the arrival of Gran Turismo. Thus there’s a nice suite of tuning options; multi-race, points-driven championships; even a nifty test track to try out your new acquisitions. Perhaps most impressive is how MPR caters to a broad range of experiences, whilst never seeming a hotch-potch of ill-fitting styles. This is likely down to how smartly it deals with each discipline. Races are set against a full backdrop of environmental obstacles, including snow, fog, rain and even at night-time stages, where you get to twiddle round with the awesome, adjustable headlight beams. 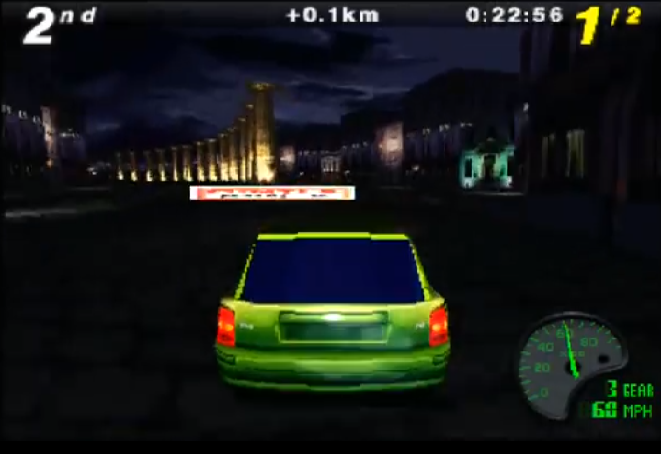 But just as it seems to moving on Colin McRae Rally territory, Max Power mixes the night idea with the tight, windy streets of Rome, making for a wholly different, though equally effective, street racer style of racing. Slaloming between Incan monuments amidst the Peruvian mountains, threading through impossibly narrow slip roads in Monaco, and seeking out opportunistic short-cuts all evoke memories of the arcade-spirited, early PlayStation racers. Just as surely though, TOCA comes to mind. The need to clip every apex, coaxing pleasantly weighty cars round technically demanding courses in a bid to maintain every ounce of momentum proves a tough, absorbing task. But it’s a rewarding one, as your times start to tumble with extended play. The dirt sections create an unusually tangible, impressive sensation of understeer upon cornering, whilst the front, rear and four-wheel drive cars offer credibly noticeable pros and cons on different surfaces. For all the appeal of its authentic cars, Max Power Racing remains a refreshingly gimmick-free experience, a game whose devious delights stem almost entirely from the diversity and creativity of its track design. Whilst not quite on the V-Rally scale of moon physics, MPR’s can still be pretty punishing. Enough to dissuade players from taking too much curb or straying too far into the undergrowth, at any rate. A delightful, illusive balance must be sought between over-aggressive leading to crashes, and being a little too conservative and simply not driving fast enough. Like the best driving experiences, Max Power Racing ultimately favours the brave. The A.I. represents a decent step forward, as competitors seem less inclined to a Destruction Derby mentality than before, and their times are less erratic. 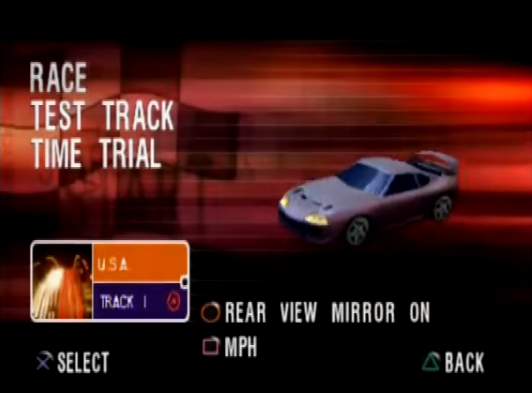 Marvellously, the game’s nasty instant Game Over punishment for sliding down ravines/plunging down waterfalls extends to the computer controlled cars. 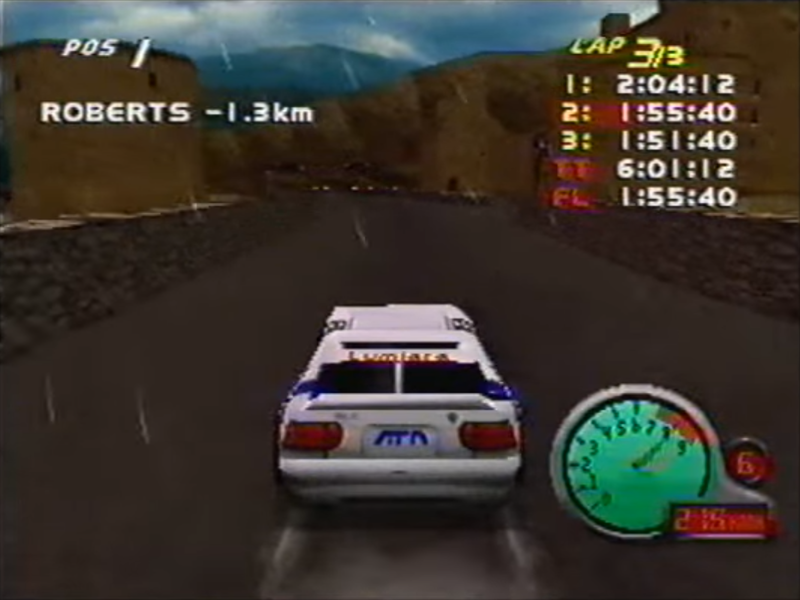 One memorably treacherous night race set in a US canyon, driven alongside the spectre of a looming chasm for the majority of the lap, saw all of my competitors perish by the time the final lap had come around. One of Total Drivin’s strongest suits was how vibrant and attractive its visuals were, and Max Power Racing looks even better. Whilst the cars look a touch boxy, the tracks more than make up for it. Each locale is packed with nice, location-appropriate touches, and feels an individual amongst its peers. Rome sparkles amidst its evening setting, refined by bridges and street lamps, the colosseum looming over parts of the lap. Brazil’s canopied rainforests are fun, lush and treacherous, whilst China’s idyllic waterfronts are replete with elegant, detailed crafts, which look absolutely stunning. All the details, big and small, are shown off in fine style by the dynamic replays. The only let down presentation-wise comes from the sound, with a listenable but limited selection of five BGMs and some rather whiny engine notes. Thirty ever-more elaborate courses and a steady stream of new, quicker vehicles means the Arcade mode makes for a significantly bulkier, more long-term venture than its name suggests. Championship opts for series-style tournaments of either five or ten races. These are geared very much towards the connoisseurs though, and become exceptionally difficult. Split-screen mode makes a return and runs well, but its appeal proves fleeting without computer competitors. Whilst Eutechnyx would commit more fully to licensed racers with Le Mans 24 Hours and F1 World Grand Prix the following year, Max Power Racing marked a high watermark for their racing endeavours. It tried its hand at a bit of everything, and pulled the majority of it off so smoothly that it was easy to miss just how broad a racing experience it offered. The Max Power tie-in proved an effective coup at the time, and whilst the branding may not have endured, MPR is a driver’s driving game.